La Clinica de Familia transitions to eClinicalWorks. 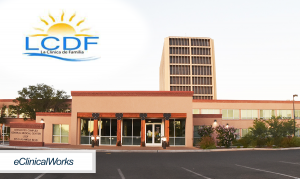 WESTBOROUGH, Mass.—September 19, 2018—eClinicalWorks®, a leader in healthcare IT solutions, announces that La Clinica de Familia (LCDF), a Federally Qualified Health Center (FQHC) in Doña Ana County, New Mexico, will transition to the eClinicalWorks cloud-centric EHR solution for its 155 providers across 19 locations, including five school-based clinics. Use of the cloud-based technology will support care coordination between providers, staff and patients to enhance communication and improve the delivery of care. eClinicalWorks V11, with a new core, will provide LCDF with innovative tools to streamline and improve overall efficiency and communications and encourage preventive care for its patients. V11 will create cycles of care that help the organization better understand patient needs, accurately gauge risk, and promote more effective treatment and better outcomes. The eClinicalWorks cloud-centric EHR includes an Electronic Medical Record, Electronic Dental Record, and behavioral health services record — providing a fully integrated technology platform with each patient’s records. The solution will improve LCDF’s operational efficiencies and provide high-quality, evidence-based care for its patient populations, regardless of the setting. Serving the community since 1978, LCDF provides health care for people of all cultures through a system of seven medical clinics, seven dental clinics, five school-based clinics, behavioral health specialties, and family services, including Early Head Start and Healthy Start. LCDF’s programs are funded by grants, contracts, and fee-for-service.